There is a big mistake with this picture which you might not immediately catch. I took this picture in the fall and I guess it has been a while--or maybe my memory isn't very good--because I could have sworn this place was called Mono Bay. 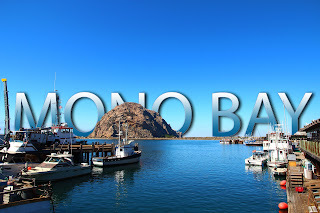 So I photoshopped it with a big mono bay sign which is unfortunate because it is called Morro Bay. Morro Bay is a great spot to visit. Not sure I would want to live there (it's a little too sleepy for me) but it is very picturesque and they had some pretty good chowder on the docks. It's on the coast, north of Los Angeles on the way to San Francisco.